What do Admiral Nurses do? Dementia UK’s GEANS (Getting Evidence into Admiral Nurse Services) programme collects evidence of how Admiral Nurses make a difference to families living with dementia, and how the work Admiral Nurses do promotes best practice in dementia care. During 2016 and 2017, Dementia UK’s Research and Evaluation team is working with seven newly established Admiral Nurse services to evaluate their services. Over 12 months, the Research and Evaluation team will use data collection tools, developed for the programme, to collect data about each Admiral Nurse service. For each service, the data will be collated into an evaluation report, which will be aimed at management and commissioning audiences to prove the effectiveness of Admiral Nursing while recommending how the service can be developed. Throughout the year, the local Admiral Nurse teams will also receive support and guidance from Dementia UK’s service evaluators. Dementia puts a significant strain on health and social care systems, so commissioners and service providers are developing models of support for families and carers of people with dementia (PWD), to reduce this strain. This is why the number of Admiral Nurses is growing and there is the need to increase this number further, as evaluation reports of Admiral Nursing services to date have pointed to their positive value. However, there remains little published evidence of the effectiveness of Admiral Nursing services and the added value of their specialist role. Whilst most Admiral Nurses are experienced at collecting data many lack the resource needed to translate this into evidence, to prove the service’s effectiveness and provide recommendations for service development. Additionally, commissioners and service providers require data to prove the service met their expected outcomes so as to continue the Admiral Nurse service. 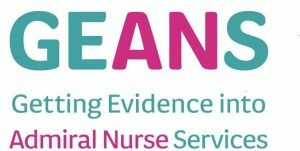 As the Admiral Nursing community continues to grow it is becoming increasingly important to collect data consistently in order to identify and promote effective Admiral Nursing models; and this is why the GEANS programme has been introduced. Dementia UK has developed GEANS in collaboration with five senior Admiral Nurses – who are experienced in working in a variety of care settings – together with senior staff from Dementia UK, and two experienced evaluation consultants, Jane Suppiah and Geraldine Mynors (Mynors Suppiah). Dementia UK’s Expert Reference Group on research and evaluation has also provided feedback on the scope of GEANS and there are plans to establish an advisory group. The GEANS model has been adapted from GEMSS, an evaluation and service improvement project developed by the MS Trust for MS specialist nurses, which was successful in developing the ‘evaluation mindset’ of participating MS specialist nurses, and significantly enhanced the evidence base of MS specialist nurses nationally. The GEMSS project (Generating Evidence in Multiple Sclerosis Services) was piloted with 5 MS specialist nurse services and rolled out to a further eleven teams between 2012 – 2015. You can find out more about the GEMSS project here.